The Hobie Outback comes fitted with two 8” ‘Twist & Seal’ hatches, however hatch bags are only available as an optional extra on the 6” hatches. Having a hatch that opens into the hull of the kayak is only really useful when it comes to rigging access or perhaps stuffing a small dry bag in there. If it’s to be really useable it needs some sort of container to allow gear to be stored and not to roll around the inside of the kayak. The only real solution I could find was to insert a collapsible ground bait bowl into the hull. I originally tried to insert the large version (32cm) of the Daiwa Airity bowl into through the centre 8” hatch. I managed to break the re-enforcing hoop in the process, perhaps if I’d inserted it via the front hatch that might not have happened!. However, it turned out that the bowl tended to collapse and move about, as well as not sitting well on the semi-cathedral hull shape of the Outback. I liked the idea of a large soft bag inside the hull, though it needed to be supported to be useable. I decided to remove the centre hatch to check out the possibilities. I was pleasantly surprised at the makeup of the hatch. The hatch cover is held in place with self-tapping screws (initially not a pleasing thought), though it transpired that these screws pass directly through the hull into a circular backing plate. This wasn’t expected and potentially made a solution far easier. I removed the metal support hoop from the canvas bowl before making a small incision and removing the broken hoop. The same method could be used after cutting an intact hoop with a pair of wire cutters. The bowl was about 2” larger in diameter than the circular backing plate for the hatch. I removed some material (triangular cuts) from the top edge of the bowl by making it possible to ‘neatly’ fold the bowl edges over the backing plate. I used Evo-Stik 528 impact adhesive to glue the edges of the bowl onto the upper surface of the backing ring. To neaten the job up and to provide an even sealing surface when re-fitting the bag, I added a ring of neoprene to the top of the bag. Basically that was the job completed, however, I carry a hand operated bilge pump on the kayak. This raised the question of how would I pump water from the kayak when the centre hatch had a waterproof hatch bag fixed into place?. This was a concern so I decided to add mesh panels into the sides on the bag. I purchased some plastic mesh design to keep leaves out of rain gutters. I removed a couple of pieces of the bowl using a sharp knife. The bowl is constructed with a plastic type outer material with a mesh inner layer. The plastic mesh was slipped in between these two layers and glued into place using contact adhesive. I found it best to do one edge at a time, a little time consuming, though it results in a neat finish. Should the kayak flood internally, the hatch bag will also flood. This still permits me to use a manual bilge pump through the centre 8” hatch. The vented panels will also permit air flow which will aid drying when the kayak is in storage. The above photo shows two mesh panels at the 12 o’clock and 6 o’clock positions, the finished item has four panels, with the other two at the 3 & 9 o’clock positions. The bag assembly weighs very little and inserted through the front hatch and pushed back into position. It’s just a case of then screwing it back into place. That’s the job completed and the finished product cost around £10. It provides a huge amount of useable internal storage space, especially when you compare it to a standard manufacturers hatch bag. The photograph above perhaps doesn’t do the bag justice. The hatch opening is 8”, the bag diameter internally is almost 13” and the bag depth is 8”... that’s over 20 litres (4.4 gallons, UK/5.3 gallons, USA). You had a kayak (the big game) that had a purpose built trolley to get you from the car to the launch. That could get you out to the marks at an acceptable speed. That had an anchor system to deploy the anchor and drift chute. That had a bait cutting board and bait storage. That had a dry box/live well. That had rod holders. That had a fitted fish finder and GPS. That had a large centre hatch given access to the inside for extra storage and was easy to pump out if necessary. That had a very stable fishing platform that caught congers, rays, cod, dogfish, whiting, tope and skate at anchor. 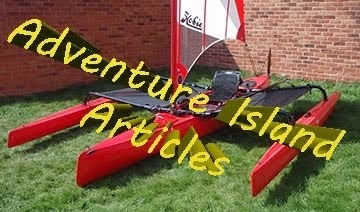 Why would someone (that would have to) pay nearly £2000 for a Hobie Outback plus trolley, anchor trolley, turbo fins, dry box/live well plus additional costs to do the same as the kayak they already have and to do the same type of fishing they already did successfully in the kayak they already have? It makes me chuckle, in over five years of publishing to this website I've not received any negative comments. However, since I've been sponsored by Hobie and provided with a Hobie Outback to fish from, there's been several comment with slightly jealous undertones! The Big Game is a very capable kayak and has served me very well indeed as a first kayak. However, there are better kayaks on the market. The Hobie Outback is far more stable, better built, faster and features the Mirage Drive. Being a new kayak it requires rigging and modifying as did the Big Game. For me that's a lot of fun and I'm enjoying 'starting from scratch'. As much as there's some logic in what you say, the fact is that people will change kayaks and upgrade as time progesses. Some people will go for a lower end model, other people will prefer to by something more expensive if funds permit.. many people will purchase a new kayak as they just fancy a change! So to answer your question with a question.. why would some people trade in a perfectly serviceable vehicle to replace it with a bigger, faster and more luxurious vehicle (let's not forget more expensive!) when their old vehicle fulfilled their basic requirements??? I can assure you the comments have nothing to do with jealousness as I have two kayaks and one is a Hobie Outback. I utilise the Outback for what it is best suited for which is lure fishing on the move and trolling and it has fittings for that purpose. It is an excellent kayak for that type of fishing. I paid the £2000 + because with experience I could see the advantages it would bring me for a certain type of fishing plus I could afford it. 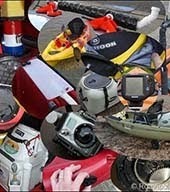 I know of several people that have more than one kayak ad use the all for different situations. My point was that you appear to be trying to make the Outback into the Big Game to do the same type of fishing instead of as you say upgrading and utilising it to its best advantage. Why not keep using the Big Game with all its already customised fittings for your basic requirements e.g. fishing at anchor and customising the Hobie to take advantage of what it is really great for? The Hobie Outback will be my only fishing kayak (the Big Game is retired), therefore it has to be capable of all types of fishing. 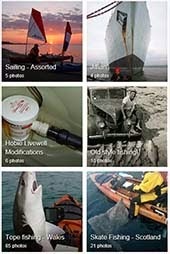 That'll include anchoring, drifting, etc this will encompass bait and lure fishing. I'm rigging it up to be an all rounder. I'll also be sailing it in the warmer months. I'm not trying to make it into the Big Game, I just found the 8" hatch pretty useless without a container of some description. The addition if a removable chopping board is a nice option to have as required. An anchor trolley is a must for safe anchoring and an anchor light (article yet to be published) is a legal requirement for night fishing. 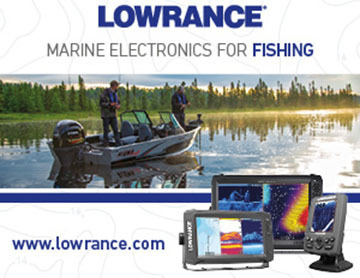 The only other items to be added are an electric bilge pump and a fish finder. As the year progresses I intend to diversify and spend far more time targetting bass and pollack with lures, something the Hobie will be ideal for. 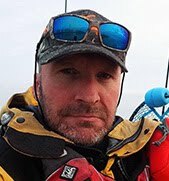 I've experienced this type of fishing from an Outback a few months ago and I intend to take a much greater interest in this aspect of the sport. Out of interest how would you suggest 'customising the Hobie to take advantage of what it is really great for'? As said the Hobies with there hands free mirage drive are at there best when lure fishing as per the USA and Australia. Customizing or adding feature to the basic Outback for lure fishing is straight forward. The anchor trolley is used for deploying a drift chute to slow down a drift over a mark when necessary. Something that holds upright rod holders is fitted. It cold be a crate, a dry box or as you have done the live well. The upright rod holders are used to house pre-set up rods with different lures to facilitate a quick change of lure or tactic. Two rod holders are fitted that are suitable for trolling. In the summer and autumn months trolling close to shore or over a mark can be a very effective way of catching Sea Bass. It is also great to have the option to drift over a mark then troll back when re-setting the drift. I would not recommend Ram Tubes for trolling. They are fine for static fishing but slip too easily when trolling. This has been highlighted by the Australian yakabout on one of his videos (cannot remember which one). It is far better to use something with a quick release locking mechanism such as the Scotty Holders. 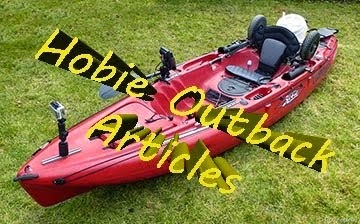 For lure fishing there is plenty of storage on the Hobie for extra lures and bits of tackle. Apart from that a scoop net or boga grip, pliers and a priest. The usual fish finder etc goes without saying. All pretty straight forward. As a Hobie representative I really hope you do utilise the Outback more than just fishing at anchor that would be great to see. Good luck with it. The Hobies are certainly suited to lure fishing, though they're perfectly suitable for all types of fishing, I think it's important that they're not seen as a specilast fishing platform. I've spent a couple of weeks lure fishing in the US (see my reports for Florida & Texas) and took much advice from those for whom it is bread and butter fishing. I have to admit that I enjoyed the minimalist fishing, taking 2-3 rigged rods, a set of lures and a crate with odds and sods. I used to be an avid lure fisherman (shoreside) for many years. I've recently invested quite some money in gear suitable for lure fishing from the kayak and it's already seen some action. I agree with your comment on the RAM tubes, they can be difficult to lock in place and the later composite models are particularly poor in that respect. I've fitted RAM tubes for fishing at anchor, though I've added GearTrac up front which permits me to fit Scotty mounts either side. The setup has been carefully thought out to enable it to be used for all types of fishing. I'll post an article covering the completed kayak in 3-4 weeks time, I think you'll find that all the suggestions that you've mentioned have been encompassed in my rigging options. My fishing over the next few months is going to be very varied, it'll include lure & bait, anchoring, drifting, trolling, spinning, etc. At the moment I'm just completing some final aspects of the rigging and enjoying a few short trips to iron out any problem areas. Out of interest, where are you based?. Please feel free to add your name to the comments. I really like this idea…and unlike the comments above…I really don't care if you have 30 kayaks that all do the same thing!!! My question is simple, With this bag installed, does the bait bucket that comes with the Outback still fit inside the hatch….I envision keeping all my soft plastics like worms and tubes in the bag but like the bait bucket for loose hooks and drop shot weights..
Hi, in a word, yes. Both the standard gear bucket and the optional deep bucket will still both fit straight into the hatch. Look forward to seeing what you do!